Tali Lando Aronoff, MD, shares a poignant, funny and inspiring account highlighting her battle with breast cancer in a guide for the recently diagnosed and their families. 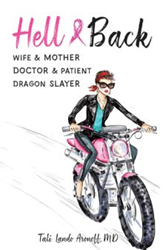 In her personal and medical memoir titled “Hell & Back: Wife & Mother, Doctor & Patient, Dragon Slayer” (published by Archway Publishing), Aronoff, a pediatric ENT surgeon, recalls how she felt when she was diagnosed and gives the recently diagnosed and their family and friends, an idea of what to expect as she shares how she battled and survived the disease from a doctor-patient perspective. According to Aronoff, the book touches on many issues one encounters when diagnosed with any serious disease: loss of control, regret, problems with intimacy, changing body image and sense of self. In contrast, it also highlights the power of friendship, family and human resilience. Dr. Tali Lando Aronoff is a full-time pediatric otolaryngology (ENT) surgeon with a busy practice split between her offices and the operating room. She is also a mother of three young girls, a scuba diver and a breast cancer survivor. Though a physician by training, she is a writer who started composing poetry and story writing at the age of 7. At the time she began “Hell & Back,” she was juggling the realities of a newly discharged preemie, her father’s brain cancer and her own advanced cancer diagnosis. Aronoff grew up in Allentown, Pennsylvania. After a decade living in New York City, she now resides in Westchester with her husband and children.